Individual and Team Participation Requirements - Who is eligible to complete in Wege Prize 2019? The Challenge - What does Wege Prize 2019 challenge competitors to accomplish? The Process - What kinds of materials are Wege Prize 2019 competitors expected to submit and when? 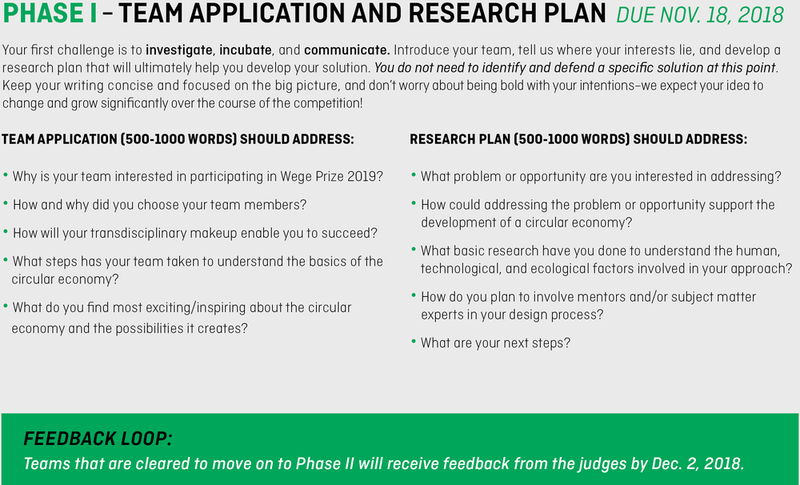 Judging Criteria - What are Wege Prize 2019 judges looking for? The Fine Print - What am I agreeing to by competing in Wege Prize 2019? *Both undergraduate and graduate level students are eligible to compete. Teams can be composed of both undergraduate and graduate students if they so choose. *These are the minimum requirements. Teams with the greatest disciplinary and institutional diversity will likely have a higher probability of success. HAVE QUESTIONS ABOUT INDIVIDUAL OR TEAM ELIGIBILITY? EMAIL THEM TO WICKED@WEGEPRIZE.ORG. For Wege Prize 2019 we will be revisiting the following wicked problem: How can we create a circular economy? 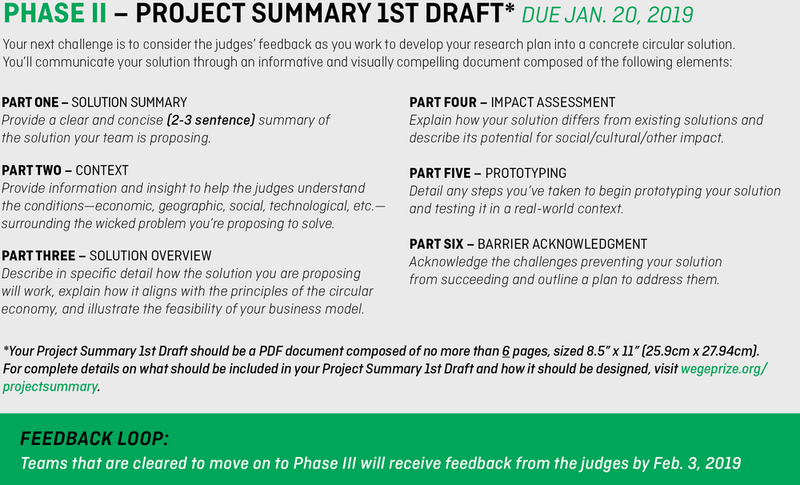 Over the course of nine months and four distinct phases , Wege Prize teams will grow their ideas from an informal research plan into a fully-developed solution that can be prototyped and tested in the real world. Guided by direct feedback from competition judges, teams will work to rethink and redesign the way economies work by creating regenerative solutions that have widespread and lasting positive impact. To learn more about what happens during each of the four phases of Wege Prize 2019, use the arrow buttons to navigate through the slides below. Have you clearly identified the problem you’re trying to solve? To what depth have you studied and analyzed the problem? Have you researched existing solutions? Have you consulted experts to refine your solution? Is your presentation organized, and does it deliver a clear message? Have you gotten creative and thought outside the box when developing your presentation? Can you provide immediate and thoughtful answers to the judges’ questions? Does your solution help accelerate us into a circular economy? Is your solution technologically, economically, and financially feasible? Is there proven customer need for your solution? Is there sufficient motivation for people to use your solution? What system conditions need to exist to make your solution possible? If your solution builds on an existing project or research you’re already involved in, to what extent have you built upon it? Have you built a strong and balanced transdisciplinary team? Have you engaged all of your teammates in the development of your solution? Beyond dividing up different tasks, have you worked across disciplinary boundaries and brought your different perspectives together? Have you effectively engaged mentors and/or subject matter experts in your design process? This competition is void where prohibited by law. There is no fee to enter the competition, however, you are responsible for any costs you may incur for creating and submitting the materials that comprise your solution. Upon the date of submission, your solutions and any materials that comprise them will remain your intellectual property, which you are free to develop and promote at your own discretion. However, by submitting the materials that comprise your solution in this competition, you automatically grant Kendall College of Art and Design of Ferris State University (KCAD) and The Wege Foundation the right to use said materials, as well as your personal profile information, including but not limited to, name, school, major, team name, image, and likeness, for any non-commercial purpose, including display, promotion, and assessment. Any non-commercial use of the materials that comprise your solution by the above parties will be accompanied by the appropriate attribution as to their creator and/or source. To win, teams must have at least one member in attendance to present at the final presentation and awards event. All winners of cash prizes are solely responsible for any applicable U.S. income tax. Taxes will be withheld from any cash prize awarded to foreign citizens. Winners will be notified in person and will be required to complete an affidavit or declaration of eligibility/liability release, a publicity release, and such other documents as may be required by KCAD and The Wege Foundation. Required documents must be signed and received within 7 days of the date printed on the prize notification. Failure to comply or return of any prize notification as undeliverable may result in forfeiture of prize. A parent or guardian of a winner not of the age of majority in his or her state of residence will be required to ratify and sign required documents. Accepting prize money constitutes permission (except where prohibited by law) to use winners’ names, educational background (including name of institution and major of study) and/or likenesses for promotional purposes without further notice or monetary compensation. Rules and regulations subject to change.